Dr. Castelein is originally from Lake Geneva, Wisconsin. He attended The University of Dayton in Dayton, Ohio where he earned a bachelor’s degree in accounting and a minor in biology. While at UD, he was very active in Alpha Epsilon Delta, a premedical honor society, as well other business organizations. He was also involved with intramural sports and coached the university’s club soccer team. Dr. Castelein completed his medical education at Scholl College at Rosalind Franklin University in North Chicago, IL. His medical training was shaped at several VA and county hospitals giving a full breadth of patient experiences. While attending Scholl, Dr. Castelein also earned a Masters in Healthcare Administration. Dr. Castelein’s medical education was completed at Genesys Regional Medical Center in Grand Blanc, MI. 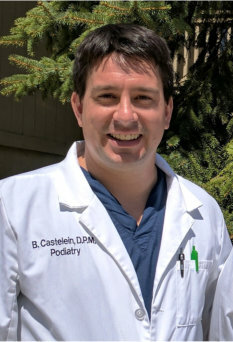 During his time at Genesys, Dr. Castelein received advanced training in surgical procedures of the foot and ankle as well as diabetic wound care with an emphasis on limb preservation. Dr. Castelein is excited to join the Fenton and Brighton communities. In his free time, he enjoys boating, golf, skiing, and cheering for UD, University of Wisconsin, as well as the Chicago Bears, Blackhawks, and Cubs.